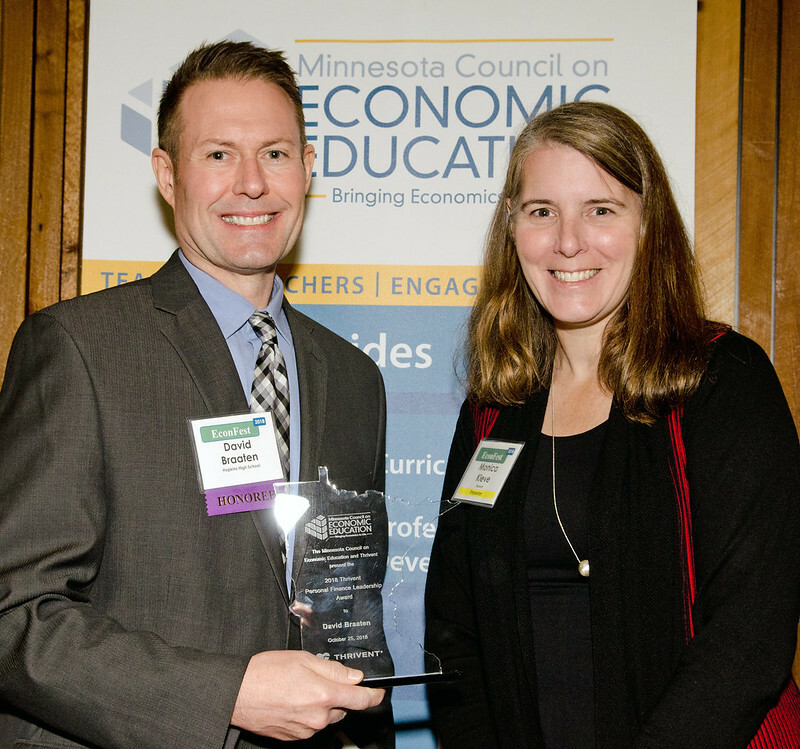 Two Hopkins Public Schools educators were honored at the Minnesota Council of Economic Education (MCEE) 2018 EconFest at University of Minnesota on Oct. 25. Business education teacher David Braaten received the Thivent Personal Finance Leadership Award and Glen Lake Elementary teacher Hannah Swaden took home the Thrivent Personal Finance Educator Award. “I was super excited and felt extremely honored to be recognized by the Minnesota Council of Economic Education for the leadership in finance award,” Braaten said. Braaten has been a teacher in the Hopkins school district for 18 years. He has also been an active member of the MCEE community for years. He has presented several workshops on teaching financial education, and has used MCEE curricular materials to support the personal finance education curriculum at Hopkins High School. Swaden has worked in the district for eight years, and she is also a Hopkins graduate. While she is new to teaching economics concepts, her lesson plan for Jamestown Simulation caught the attention of MCEE. She was awarded the Finance Educator Award for incorporating economics into the decisions made in the settlement simulation of Jamestown. Swaden appreciates economics education because it teaches kids about sound decision making. These life skills are a constant in life, and can be overwhelming to both kids and adults. “By empowering students to make effective decisions in their lives, we are giving them the tools they need to be more engaged in the world,” Swaden said. “Developing actively involved citizens is a project near and dear to the heart of every teacher. As part of the graduation requirement, all Hopkins students take a personal finance class in high school. Through a concurrent-enrollment agreement with North Hennepin Community College, students earn three college credits for completing the final class in the sequence; the grade they earn in Hopkins becomes part of their college transcript.